Here we provide a tool that illustrates what mathematics looks like when being used in just a few workplaces . Use this tool with your group so that they have some insight into this issue. It may be best to consider this question before thinking about how to connect classroom learning of mathematics to the world of work. This will enable the group to start thinking about how mathematics is used in the workplace and how this is different from mathematics in school. Hoyles, C., Noss, R., Kent, P., & Bakker, A. (2010). 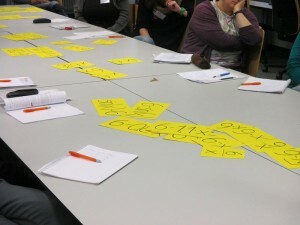 Improving mathematics at work: The need for techno-mathematical literacies. Routledge.